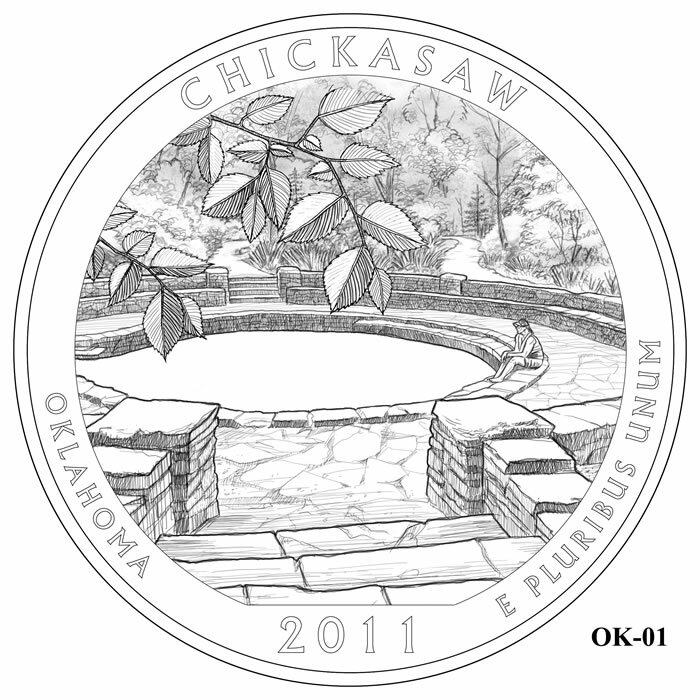 The 2011 Chickasaw National Recreation Area Quarter honors the national site found in the state of Oklahoma. These strikes should enter circulation on November 14, 2011 with an official launch ceremony held by the US Mint on or about that date. 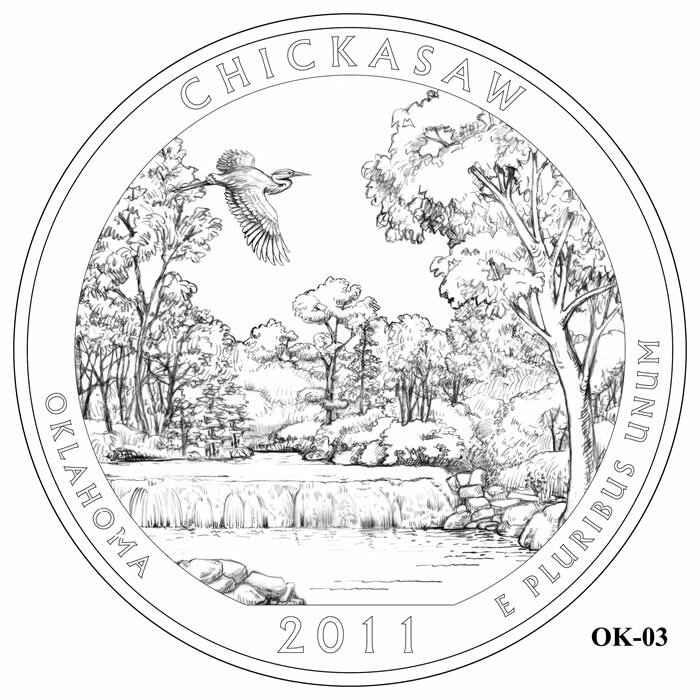 When issued, the Chickasaw National Recreation Area Quarter will be the fifth of five 2011-dated strikes from the Mint to appear as part of its America the Beautiful Quarters Program that debuted in 2010. The final design for the reverse of the Chickasaw Quarter was selected by Treasury Secretary Timothy from three available design candidates presented to him by the US Mint. The chosen design shows an image of the Lincoln Bridge found within the boundaries of the national recreation area. The limestone bridge was dedicated on February 12, 1909, the centennial of the birth of the 16th President of the United States Abraham Lincoln, and thus named after him. Surrounding the image are the inscriptions of CHICKASAW, OKLAHOMA, E PLURIBUS UNUM and 2011. The reverse was designed by AIP Master Designer Donna Weaver and sculpted by United States Mint Sculptor-Engraver Jim Licaretz. The three design candidates given to the Treasury Secretary for his selection are shown below. Before his decision was made, however, two groups reviewed the designs and offered their comment. These two groups were the United States Commission of Fine Arts and the Citizen’s Coinage Advisory Committee. 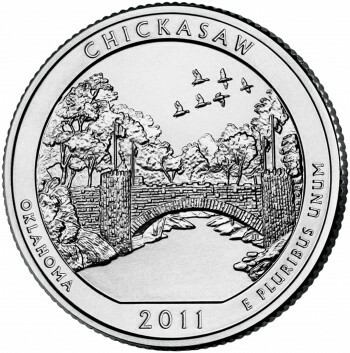 When reviewing the three Chickasaw National Recreation Area Quarter designs, the commission rejected all of them. In the comments, however, the commission "suggested further development and resubmission of the bridge featured in alternative #2 due to its distinctive form and symbolic representation of the site, while simplifying or eliminating the landscape setting." 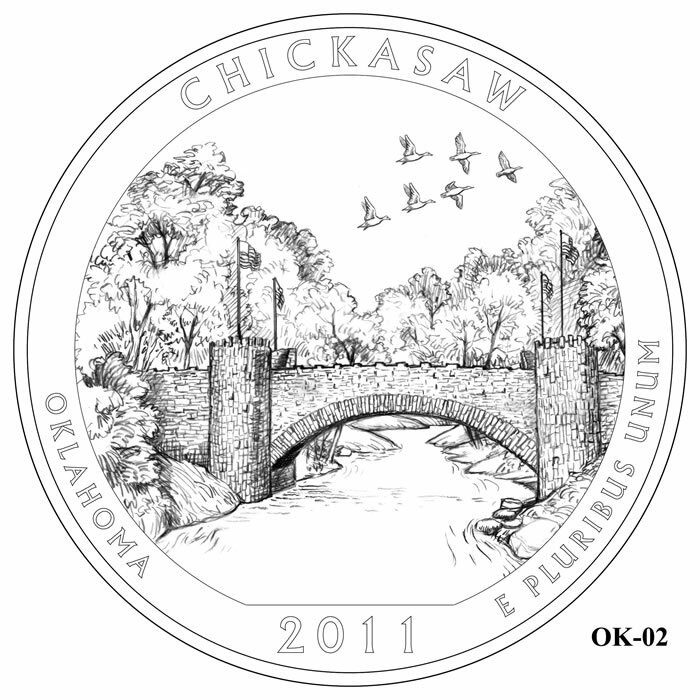 Design Candidate OK-02 was eventually selected for use on the Chickasaw Quarter. The Citizen’s COinage Advisory Committee recommended Design Candidate OK-01 but questioned the if the person show in the picture would be too small when scaled down for a coin. Chickasaw National Recreation Area was officially established on July 1, 1902, but named Sulphur Springs Reservation. The original 640 acres of the area was purchased from the Chickasaw Indian Nation and subsequently added on through the years. On June 29, 1906, Congress redesignated Sulphur Springs to become the Platt National Park, a title which it would retain for seventy years. Finally, in 1976, Congress combined Platt with nearby Arbuckle Recreation Area and renamed it to its current designation of Chickasaw National Recreation Area. The new area today consists today of just under 10,000 acres, with roughly 25% of that land covered in water. The rivers and lakes found there offer many unique recreational opportunities for visitors including boating, fishing, canoeing, etc. Of interest, the National Park Service does not charge an admission fee to enter the national recreation area. This is owed to the original agreement between the United States Government and the Chickasaw Indian Nation when the national area was first created.